Believed to have been taken by C.H. Gillford. The identity of the engine is unknown, as the number is unreadable, but since the engine appears to be in plain black, perhaps with a lined tender, it is probably one of those Renowns converted during the First World War. On the right, bridge number plate 48 refers to the underbridge, which should pin the location down fairly precisely, if someone has a list of bridge numbers. So, as usual, where is the location, what details are known of the train and the carriages, and what else can be said about anything else? This is at Ashby Junction, north of Nuneaton station. 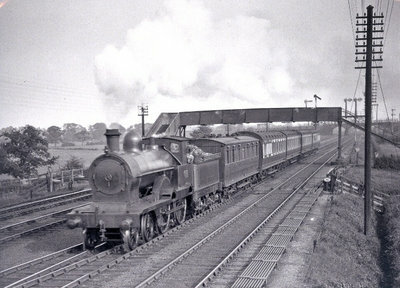 The engine is passing over the junction for the 'Battlefield Line' to Burton-on-Trent. The signals to the right of the telegraph pole control the line to Abbey Street station and Water Orton to Birmingham. The over bridge in the background carries the station bypass lines to Leicester from Abbey Street Junction. The loco is carrying local passenger head lamp code and is hauling a set of four suburban coaches plus one other. To be accurate the four coach set is not a "suburban" set but an Inter-District Set of 57ft 0in stock. The "one other" is an elderly Lancashire and Yorkshire Rly 46ft 0in Lavatory Composite of D.28. I would suggest that the date is soon after the grouping, 1923/4. Taking the 1922 WTT, and the angle of the sun, the train would seem to be the 2/15 Rugby � Stafford local timed to depart Nuneaton at 2/55. Trains to intermediate stations on the Trent Valley line were not frequent. I can confirm that it's Ashby Junction. Underbridge 48 is at 97m54c. The photo is taken from the signal cabin window. The cabin was opened 31.5.1908, but the four track layout was not completed until 5.12.1909, so it could be taken any time after then. As I can't see anything else in the picture which would definitely date it I would concur with Philip's estimate of "early LMS". The train is running on the Down Fast line. To clarify, the signals to the right of the telegraph pole apply to the Midland Goods lines, from Nuneaton Down Sidings LNWR to Abbey Junction MR, which pass under the right hand end of the overbridge. In May and Oct 1919 it was 2/25 from Rugby, but booked Slow line from Nuneaton to Tamworth. In Oct this was a 4-coach Inter-District Set on S.D circuit 5b. In July 1921 it was 2/20 from Rugby, and 2/15 a year later as Philip says. In July 1924 it was 2/16 off Rugby, still 2/55 off Nuneaton, and Fast line except on Fridays. There was no other similar train around this time of day.